This is my first post here. Since the beginning of this year I have refound my childhood hobby, modelling. Instead of just buying a kit I like and building that I wanted to build a little piece of history. On the internet I found a story about one of the final battles of the second world war. A group of German E-Boats from the 2. Schnellbootsflotille was intercepted by a three boats of the 22nd MTB flottile (MTB 493, 494 & 497). At a certain point in the battle the MTB 494 was rammed by the S-176 and sunk, killing al but three of the crew. The S-176 could not get back to port and was scuttled by the crew in the Northsea. I bought a Revell 1:72 scale Schnellboot and have been building this for some time. I am building it according to the specifications that the S-176 had. Now I would like to build the MTB 494 and put them on display together. I bought the Airfix Vosper kit, thinking this would be the right one. Luckily, before I started building someone on the Axix History Forum pointed out to me that it is not the right design. The MTB 494 was a British Powerboat Co design built in Hythe in 1943. I would like to try to convert the model to the proper specifications. 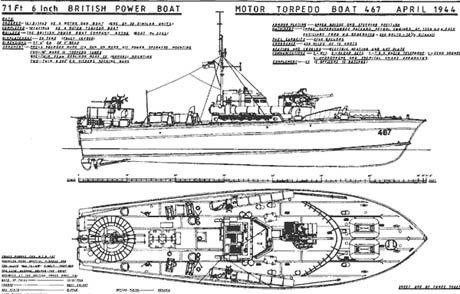 I have some photo material of the actual MTB 494 but could use some help on the differences between the Vosper and the British Powerboat Co design. I hope you can point me in the right direction. I have no experience whatsoever in scratchbuilding models. But, there is a first time for everything right? I think the CFP model would be a great help, I can blow it up to 1/72 proportions and use the parts as a template for the plasticard. Do you have a high-res version of the picture in your post? I will first finish the S-176 Schnellboot before starting on this project. I wil probably have a lot of questions and will need some help and advise here. I will keep this topic updated with text and pictures. thank you for your interest in my models. Unfortunately I have no model of a BPB boat and I'm not planning to do one. The only torpedo boats I have are the Vosper ones, an early version and a later version. Pictures of them you can see on my website. Perhaps you can use them as a guide for your model, because they were very similar. I wish you all the best for your modelling and a good success. If you have more questions, please ask me. Too bad, but the Lambert plans are worth lookin into! Thanks again! Nice to hears someone is having the same challenge! If you have any photo's that would be great. Good luck! Here's a link to my photobucket album of the Vosper, as far as it's come. You can get a pretty good idea of how I proceeded. Not horrifically difficult, but you do need to be as accurate with your cutting as possible.